In 1967, laboratory workers, all in the same lab in Marburg, Germany, were hospitalized with an unknown disease. The laboratory workers were exhibiting the same symptoms, including fever, diarrhea, vomiting, massive bleeding from many different organs, shock, and collapse of the circulatory system. In this outbreak, 31 people were infected, and seven died. The source of the infection was traced to a virus infecting African green monkeys that were imported from Uganda, Africa, and were being used for polio vaccine research. This new virus was eventually designated as a new virus family termed Filoviridae. The other members of the family are Ebola viruses (five different species). Filoviridae contain one negative-sense RNA strand and have a covering or envelope composed of a lipid membrane. The disease Marburg virus causes is termed Marburg virus disease. The most recent outbreaks of Marburg virus disease have occurred in Uganda. In 2012, 15 individuals were diagnosed and four people died (27% fatality rate). Again, the Ugandan Ministry of Health reported on Oct. 5, 2014, that a health-care worker died of Marburg virus disease (formerly known as Marburg hemorrhagic fever [Marburg HF]) on Sept. 30, 2014. The source of his exposure is not clear. This is of interest since Marburg virus is a close relative of the Ebola virus, and both produce clinical signs and symptoms that are often indistinguishable. Health officials said that about 80 people who were in contact with the man who died have been identified and are being were observed for 21 days for signs and symptoms of the disease. No one else contracted the disease. Marburg and Ebola viruses are considered to be zoonotic infections (transmitted to humans from life cycles in other animals). Although it is unclear as to which animals contain both Marburg and Ebola, it is thought that both may be transmitted to humans from monkeys and/or bats (African fruit bat and Rousettus bat). There is no evidence for any insect vectors. Although it is unclear how humans contract these viruses from other animals (perhaps by eating them or by contamination of animal body fluids), it is clear that human-to-human transfer occurs by direct contact with an infected person's bodily fluids (for example, saliva, tears, excretions, vomitus, and blood). The Marburg viruses are not thought to be spread by air droplets. What are the symptoms and signs of Marburg infection? What is the incubation period for a Marburg virus infection? 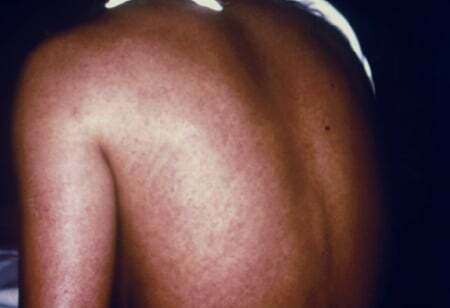 A rash occurs on the chest, back, and stomach in some individuals. The case fatality rate (death rate) ranges from about 23%-90% of infected individuals. Many of the symptoms are similar to those of other infectious diseases such as Ebola, malaria, typhoid fever, and others; so diagnostic tests are useful to rule out other causes of the symptoms. People exposed to Marburg virus usually show signs of infection no later than about 14 days after exposure, but because the clinical symptoms resemble Ebola virus disease, most people are placed in isolation for 21 days. What are risk factors for getting Marburg infections? People at risk are those who come in contact with African monkeys (bush meat means meat from monkeys) and bats; individuals who do research on these viruses are also at higher risk of becoming infected. There have been several outbreaks in Africa in miners due to their exposure to bats. Veterinarians may also be at higher risk if they are exposed to African monkeys. Also, people who care for Marburg virus-infected patients and/or health workers who remove those bodies of deceased Marburg virus-infected patients are at high risk of contracting the disease. How do health-care professionals diagnose Marburg viral infections? The diagnosis is usually not made from clinical findings; however, during outbreaks, clinical findings should trigger health-care professionals to isolate patients who may have symptoms of Marburg virus infection. There are laboratory tests including polymerase chain reaction (PCR) and enzyme-linked immunosorbent assays (ELISA) that can detect the Marburg virus later in the course of the disease. These help distinguish Marburg viruses from others that cause Ebola and Lassa fever. What treatment is available for Marburg virus infections? Like Ebola and many other viral diseases, there is no specific treatment for Marburg virus disease. Patients are given supportive hospital care by maintaining their fluid and electrolyte balance and other considerations, such as replacing lost blood and maintaining a good oxygen supply. This supportive care is most effectively done in an intensive-care hospital unit. There are no home remedies to treat Marburg virus infections. What specialists treat Marburg infections? Most individuals with Marburg virus infections are treated in hospitals in the intensive-care units. Specialists who treat the patient are critical-care specialists, hematologists, infectious-disease specialists, hospitalists, and lung specialists. Is it possible to prevent Marburg virus infections? There is no antiviral drug or vaccine approved for use in humans against Marburg viruses. Preventive measures are based on barrier techniques (isolation techniques) that isolate the infected patient from other humans. Those health-care professionals who treat Marburg virus-infected patients must use barrier protections such as gowns, gloves, masks, and shoe coverings; most experts say the best barrier is a hazmat suit and a well-informed person who knows how to decontaminate a hazmat suit. What is the prognosis for a Marburg virus infection? What complications may occur with Marburg infections? What research is ongoing about Marburg virus infections? Research about these viruses is ongoing. Sarepta Therapeutics has been developing the RNA-interfering drug termed AVI-7288. This drug is targeted against the nucleocapsid protein of the virus, and the company has reported infection protection in monkeys ranging from 83%-100% when given four days after the monkeys were infected with Ebola. This drug is undergoing a phase 1 safety trial that began in May 2014. Another company, Tekmira Pharmaceuticals from British Columbia, has a lipid nanoparticle that interferes with the RNA replication of this virus. It too has shown protection against Marburg virus infection in monkeys. This drug is termed TKM-Marburg (also termed NP-718m-LNP). Why is Africa now seeing so many cases of what were relatively rare viral diseases like Ebola and Marburg virus infections? Destruction of habitats of monkeys and bats bring humans into close contact with those animals that harbor these viruses in the wild. Poor economies have left many African people destitute so that some of them hunt, kill, and eat wild animals like monkeys (bush meat). Even in countries with poor economies, a few major cities have hospitals and those individuals who are sick are brought in from isolated villages and, if not diagnosed and isolated, spread the disease inadvertently to other humans. Africa has undergone the worst outbreak of hemorrhagic fever caused by Ebola virus that it has ever seen (2014-2015, with about 28,610 suspected and/or confirmed infections and 11,380 deaths). For the first time, patients had become infected outside of Africa. It is disconcerting that yet another hemorrhagic fever caused by Marburg virus may enter this potentially lethal arena.